Click here to read our UPDATED Coffee Shop 2012 Report! The coffee industry and the coffee shop business has boomed in recent years, especially with regards to specialty coffees. The market for specialty coffees has grown as consumers become more educated about espresso-based drinks and how they are made. According to a National Coffee Association Annual Drinking Trends Survey, specialty coffee consumption has risen from 9 percent in 2000 to 16 percent in 2004. Every day, more than half of the adult population drinks coffee, 108.9 million people. The United States accounts for 52 million of those coffee drinkers. While fast food chains are growing at a rate of 2 percent each year, coffee shop chains grow more than 10 percent annually. Even though 75 percent of the cups of coffee brewed daily are consumed at home, 66 percent of Americans buy their coffee outside of their homes. The Specialty Coffee Association of America reported at the end of 2003 that the retail coffee shop count in the country had reached 17,400 or 4% more than in 2002. The market size of coffee grew from $7.53 billion in 1999 to $8.96 billion in 2003. Seventy-seven percent of U.S. adults drink coffee daily, and gourmet coffee consumption has risen in the past five years. According to Scarborough Research, a market research firm that studies media, lifestyle, and shopping patterns in the United States, in October 2004, 12 percent of adults have been to a coffee shop in the past month. Although popularity of coffee shops has recently spread across the nation, the West coast has the most coffee shop patrons. The ideal ratio of coffee shops to residents in a particular area is 1:10,000. * Coffee Bar Patrons: Percentage of adults who have used any coffee house / any coffee bar during the past 30 days. ** DMA® or Designated Market Area, is a trademark of Nielsen Media Research. 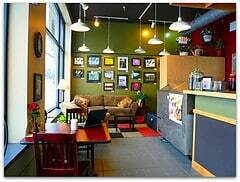 Coffee shop patrons are younger, more affluent, and educated and are 22 percent more likely to be aged 18-24. They are also 65 percent more likely to have an annual household income of $100K+. Coffee shop patrons are 28 percent more likely than the average American adult to be single and 70 percent more likely to have a post graduate degree. The average age of specialty coffee drinkers is 43. Occasional latte devotees are in the higher average income of $76,000, and similarly, cappuccino and espresso drinkers reflect an average income of $60,000. According to the National Coffee Association, seniors drink more coffee away from home, while 18-to-24-year-olds drink more coffee at home. Seniors are discovering gourmet coffee more and more as the overall percentage of coffee drinkers over the age of 60 jumped from 9 percent in 2003 to 13 percent in 2004. Adults aged 55-64 are 28 percent more likely than young adults to consume coffee away from home. Overall, at home consumption has risen from 44 percent in 2002 to 60 percent in 2004, which may be a result of a slow U.S. economy. Over 60 percent of coffee is consumed at breakfast in the United States so establishments that serve coffee and do not open until 11am are taking advantage of only 40 percent of the market. Eleven percent of adults who drink coffee away from home say that they only purchase coffee in a coffee shop, while 66 percent of adults who drink coffee away from home say they usually purchase it at a coffee shop. Forty-two percent of adults aged 18-34 purchases their coffee at a coffee shop. From 2000 to 2005, the 55 – 64 age group will grow 24 percent, which is nearly twice the amount the 45 – 54 age group will grow. The population of 25 – 45 year-olds is declining; so coffee drinking will be common currently among the elderly with some participation from the next generation. Customizing according to interests in local markets is a way for coffee shop owners to create loyalty and increase sales. Espresso and other specialty coffees are becoming popular in quick service restaurants. While consumption of gourmet coffee has remained steady, purchases of espresso beverages have risen from 4 percent to 7 percent. Gourmet coffee had been the strongest growing part of the market, but recent studies have shown that that the trend toward occasional drinkers is continuing while espresso drinks continue to rise in popularity. Specialty coffees seem to be most appealing to younger adults. The 25 – 34 age group accounted for one-quarter of specialty coffee orders in 2000 and only 10 percent of the regular coffee orders. Those 18 – 34 years old have increased their specialty coffee purchases at table service restaurants in the last two years. One-third of regular coffee orders are placed by consumers 65 and older, while that group accounts for less than 10 percent of specialty coffee orders. Index: Indices above 120 or below 80 generally indicate percentages were notably above/below expected levels based on population figures. [*] In the past seven days. Half of restaurant orders for coffee (regular and specialty) are placed during the breakfast/a.m. snack mealtime. One fourth of specialty coffee orders are during the p.m. snack mealtime, more than during lunch or dinner. Quickservice restaurants, which include coffeehouses and bars, account for 75 percent of all specialty coffee orders, but only account for half of all restaurant occasions for any type of coffee. Coffeehouse traffic grew 8 percent in 2000, while the overall growth in the quickservice segment was only 1 percent. The specialty coffee retail sector is estimated to be $8.4 billion, and for prepared beverages, coffeehouses report an average of $170,643 in gross sales. Successful coffee shop owners have moved past just selling coffee to creating environments that encourage longer visits: surfing the Internet, working from their laptops, or communicating with friends, family, and colleagues. Wireless technology is changing the way people live. Hotspots (internet access areas that deploy wireless technology) can be found in airports, hotels, and coffee shops. Some offer free access while others require paid subscriptions. Offering free wireless Internet in a coffee shop is one sure way to boost the chances of success. People are now given the option to make a connection over a cup of coffee and over the internet. Anonymous. Nation’s Restaurant News. New York: Jul 1, 2002.Vol.36, Issue 26; pg. 36, 1 pgs. 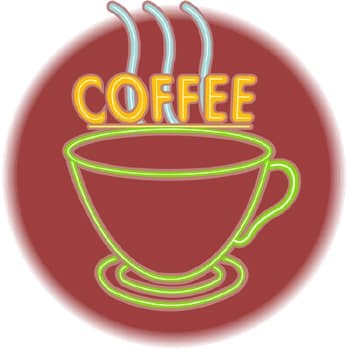 “Jumpin’ Java: rising consumption brews new breed of coffeehouses.” Restaurants & Institutions, 113 (3): 69, February 01, 2003: Pub. Reed Business Information. This material is based upon work supported by the U.S. Small Business Administration. Any opinions, findings, conclusions or recommendations expressed are those of SBDCNet and do not necessarily reflect the views of the U.S. SBA. The SBA funds this U.S. Small Business Administration (SBA) Grant. SBA’s funding is not an endorsement of any products, opinions, or services. All SBA funded programs are extended to the public on a nondiscriminatory basis. This material may be protected by Copyright law (Title 17 U.S. Code).